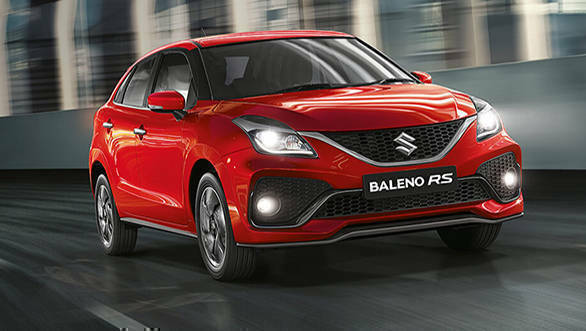 The updated Maruti Suzuki Baleno was launched in India on January 28, 2019 at Rs 5.45 lakh, ex-showroom. It was evident that a Baleno RS facelift too was on the cards. And now Maruti Suzuki has launched the updated Baleno RS in India, priced at Rs 8.76 lakh, ex-showroom Delhi, that is Rs 7 lakh more premium than its 2017 launch price. Similar to the Baleno facelift, the update on the RS is cosmetic in nature. Mechanically, the hatchback retains its 1-litre 3-cylinder turbo-petrol engine. Nexa dealerships across the country have already started accepting bookings for the 2019 Baleno RS for a token amount of Rs 15,000. We expect the deliveries to take commence in the next few weeks. Similar to the Baleno facelift, the 2019 Maruti Suzuki Baleno RS gets an update in the front with restyled front bumper that comes with a large airdam and tweaked fog lamp housing. The new bumper design makes the Baleno RS look wider from front. Additionally, it also comes with smoked finish two tone 16-inch alloy wheels. The rear profile has been left untouched. Also, in terms of dimensions and ground clearance, there are no changes compared to the previous offering. The cabin of the 2019 Baleno RS comes with new-generation Smartplay Studio infotainment system with a new 17.78cm touchscreen unit. Maruti states that this system offers smartphone, vehicle and cloud-based services such as music, news, weather updates and also locates eateries. We believe it is identical to the unit offered in the recently launched new-generation Maruti Suzuki WagonR. Powering the 2019 Baleno RS is the Boosterjet petrol engine that produces 102PS/150Nm, which is an addition of 19PS/35Nm over the four-cylinder naturally aspirated 1.2-litre petrol engine of the regular car. This engine is mated to a five-speed manual transmission. The engine though makes 8PS more in the international models. The 2019 Maruti Suzuki Baleno RS competes with the likes of Volkswagen GT TSI and also the Fiat Punto Abarth.